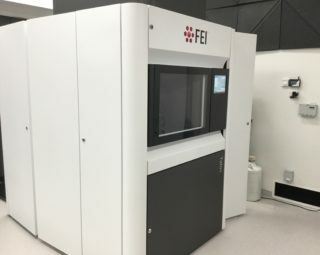 The FEI Talos field emission gun (FEG) transmission electron microscope (TEM) is built on an advanced operating platform for atomic lattice resolution imaging and nanoscale microanalysis. The TEM is equipped with highly sensitive Super-X EDS detectors for elemental analysis. This instrument is capable of 3D tomography investigations in all modes of operation (TEM, STEM & EDS).